When creating a strategic plan or going through any organizational planning process, who do you engage in that process for feedback? In May, we discussed the 4 Steps of Strategic Planning. Step one is collaboration – Collaborate with key stakeholders to inform the strategic planning process and create buy-in and ownership in the plan. Funders – current and past funders who know your organization as well as the industry to provide insight on what’s working well, what’s not working and possible changes to consider based on industry trends. Staff – reach out to your staff at different levels of the organization and in different roles to gather their diverse feedback and perspective. Board Members – some Board members will be engaged in the entire strategic process, while other Boards may only have a select committee or members engaged. Whatever the process, you will want to include all Board members in sharing the feedback in the strategic planning process. Clients – past, current or potential clients who receive your services have a perspective that could be meaningful and inform in the strategic planning process. Community Partners – reach out to other community agencies in your community who intersect with your work. Their perspective adds another layer of insight that could really help inform your planning process as you think about the future. Client A – Government Agency: Direct Service Program Staff, Direct Service Program Managers, Local Community Partners, and Leadership and Advisory Committee. Client B – Statewide Non-Profit: Staff, Funders, Key Community Partners. Client C – Multi-Sector Community Group: Parents, Employers, and Key Community Partners. Client D – Local Non-Profit: Public, Past and Current Client, School District and City, Staff, and Board Members. Once the key stakeholders are identified, how do you gather their feedback? There are different tools and resources available to make the process efficient and effective. Of course, the use of the tools is dependent upon your budget, time and capacity. We offer a summary of our go-to stakeholder feedback tools and the advantages/ disadvantages of each one. Focus Groups – Brings together a targeted group of people to gain insight on specific topics. Pro: You can get more insightful information than from a survey, such as being able to ask follow-up questions. Con: It can be more time consuming to hold focus groups from scheduling them, training the team to complete it, documenting the information during the focus group and transcribing/ synthesizing the information shared. Tip: Find a targeted group that already meets to hold your focus group. For example, while creating a plan for the Wabash County Early Childhood Education Committee, we were seeking feedback from different parent groups. We were put on the agenda during a regular parent meeting at an early childhood education program, which allowed us to gather feedback to help inform the planning process. Similarly, we held focus groups of Healthy Families Indiana staff at the Institute for Strengthening Families where many were in attendance. Surveys – Helps reach a wide audience using questions related to a specific topic to help gather feedback. Pro: Surveys can be completed on the participant’s schedule, compared to a focus group or interview when everyone’s schedules need to align in order to get feedback. Con: If the survey is anonymous, you cannot ask follow-up questions about a participant’s answer. It can also be a challenge to get people to participate in a survey. Offering an incentive will often help with this problem. Tip: Find an organization who regularly seeks feedback from a target group. Ask to add your questions onto a survey they already send. When we were seeking feedback for the Wabash County Early Childhood Education Committee, we reached out to the local economic development group and chamber of commerce to assist us with getting employer feedback. We worked together to create an appropriate survey, and they sent it to their employer contact list. Also, take advantage of local social media and news outlets. It might be difficult to get personal contact information for some target stakeholders. Posting on social media with the survey criteria could help you reach a larger audience for feedback on your strategic plan. Key Informant Interviews – Have a one-on-one interview with a specific person related to the planning process. Pro: Allows you to have an in-depth conversation about a specific topic. It also engages someone who might not be apart of the regular planning process. Con: It can be time consuming to schedule and hold these interviews, especially if you need to have more than one. Tip: When you are deciding which key informants would be best to reach out to, consider people who have lived and learned from a similar cause to your own. You will be able to learn from their success and/or mistakes. It’s also helpful to reach out to key partners and decision makers who are not yet engaged. This will help you gain feedback while also informing them of the planning process. Stakeholder feedback is useful when completing any planning process. 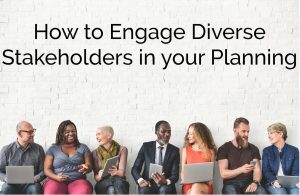 By engaging your key stakeholders at the beginning of the planning process, you will not only have a more comprehensive plan in the end but will also create buy-in from the stakeholders when the new plan is unveiled. If you need assistance with your planning process, we would be happy to help! Contact Transform Consulting Group today!